Great pics, looks like you did have fun. 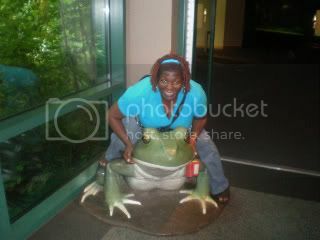 I like frogs too. I don't really know why, but I just thing they are cool. My DD#1 held a baby alligator in FL when we went last Dec. She thought it was so cool, of course she did she's 21. I couldn't do it. Thanks for sharing. 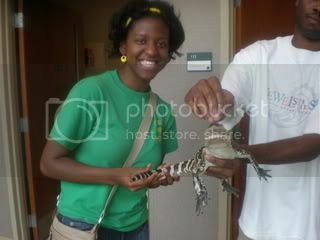 I've never touched an alligator, only snakes, and I'm that envious! I'm glad you screwed up your courage, nice photos! Ha ha ha... oh, D2D... you are a card! What great fotos. 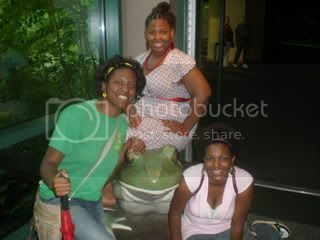 That big frog was a photogenic beast that just asked to be used as a prop, wasn't he? It looks as if you folks really had a great time. Good for you! Every once in a while I try to do things that make me nervous so I can get over the fear. It definitely makes life more interesting! Oh it looks like you all had a great time. I've never pet an alligator either, but I have had them sleeping on the porch and under the car! 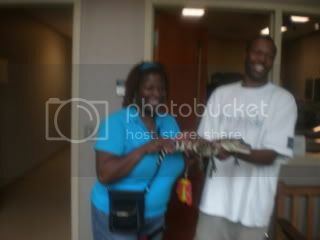 I noticed what end of the gator you was holding,,lol. the end that didn't bite. Glad you all had a great time, and i sure love thoe nature preserves! Thanks for taking us with you! From the smiles it looks as though you all had a grand time . . .